The game will be played at San Siro stadium that holds 80,000 fans. The hosts AC Milan have not showed a strong attack as they have scored 7 goals in the tournament while their opponent is tied in first with 18 goals. Milan has also committed 98 fouls as there play has been sloppy. In the group stage Milan lost two games, one to Real Madrid but tied them 2–2 the second match. The Spurs dominated the group stage by scoring goals galore and only losing one game to Internazionale 4–3. AC Milan's Player to Watch - A few years ago the player to watch would have been Ronaldinho but the latest transfer for Milan is the man I pick. Zlatan Ibrahimovic is Milan's top scorer with 13 and leads team in assists with 9 in the Serie A . Zlatan has appeared he is ready to play in the Champions league by scoring 4 goals in 6 games. He only played for 27 minutes against Ajax but expect to see him on the pitch full time. Spurs Player to Watch - The Wales international Gareth Bale is the player selected. The 21 year old plays midfield and has scored 7 goals in the EPL. He also is leading his team in Champions play with 4 goals iand 2 assists in six games. Watch for Bale to make great crosses and good forward runs. He has been noted by his manager, Harry Redknapp, that he is the best left sided player out there. These two teams have seemed to sneak into the round of 16 unnoticed but they shouldn't be forgotten. Valencia failed to win either of their home games the last time they were in the round of 16. These two teams have not played each other since the 2007/2008 Champions League and were held in the group stage. Valencia has scored 10 goals and committed 82 fouls. There biggest win was against Bursapor 6–1. Schalke on the other hand has 10 goals and their last UEFA Cup was in 1997. Valencia's Player to Watch - Roberto Saldado is leading the team with 5 goals in this tournament as his is a natural striker. It seems the tournament atmosphere has brought the best out of Saldado as he has only finished 6 times in league play. He has helped his team win big games against the Rangers and Bursaspor. Schalke's Player to Watch - Raul Gonzalez is Schalke's veteran striker that knows how to put the ball in the back of the net. Gonzalez is UEFA's all time leading goal scorer and has won the Champions League three times. His fame came from his previous club Real Madrid where his tenure was 18 years and that consisted of 323 goals. He has started and finished every game and has 2 goals and 1 assist. This tie is an interesting one, because it is filled with quality sides that may be unknown commodities to the average soccer fan. Roma’s a perennial power in the Italian league, but because their name isn’t Juventus, Ac Milan or Inter Milan, they receive little recognition. Shakhtar Donetsk’s identity crisis stems from not playing in a well known league. The Ukranian giants have dominated domestically, and generally have had some relative success in Champions League, often advancing to the knockout stages. Both teams will be pleased with their draw, having avoided the well known giants of European football, but both should be wary of their opponents. This tie should be even more interesting, because either team can win. Some other draws are more “Hollywood” boasting world famous clubs, but they may not be as interesting as this one, with both teams trying to make a name for themselves. Darijo Srna is a flyer, a true winger who loves to fly up and down the flanks. The Croation has great stamina, and is highly regarded outside of Ukraine, with many teams mentioning him as a player of interest in transfer windows past. The Shakhtar captain will give Roma left back John Arne Riise fits, with his nonstop work, challenging the Norwegian to stop his service into the box. The man who is likely to be on the end of the crosses is Eduardo. The Croat-Brazillian striker, and former Arsenal man, has recovered from a horrific injury some of you may have seen (youtube it if you have a strong stomach), and is back to scoring ways in Ukraine. An ambitious player, look for him to shine on the big stage, possibly netting a goal or two over the tie. For a long time I have been a fan of Daniela De Rossi. American’s may know him for his moment of fury in the 2006 world cup, when he elbowed American Brian McBride right below the eye, being sent off for the vicious attack. His conduct following the incident, however, reflected how he is as a player, top class. He apologized, both verbally and in writing, and did something most professional athletes refuse to do, accept blame. That’s enough about his past however, his present is just as notable. The engine room of the Roma side, he has driven comparisons to Steven Gerrard, because of his ability to strike from distance, and the way he bosses games from the middle of the field. He sits deeper however, and likes to break up play as a holding midfielder, then start attacks as a deep lying playmaker. The Gerrard comparison also reflects his attitude, as he is Roma through and through (as Gerrard has only ever played for Liverpool). The player has refused transfers in the past, because of his love for his hometown club, and has vowed to never leave. 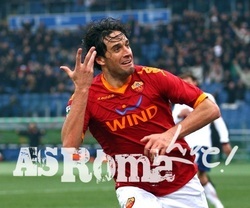 He will look to provide service to talented strikers Mirko Vucinic of Montenegro and Francesco Totti. Both have been prolific at points in their career, and both are currently firing. This strike force however is temperamental, and doesn’t always give 100% effort in every game. If they decide to play, they could trouble the Shakhtar backline constantly. Roma has the disadvantage of playing at home first, but I think they’ll squeak past the Ukranian side when they play in Rome. 2-1 will be the home score, in a tight game with neither team wanting their chances to end after one leg. Ukraine is an extremely tough road trip, for any team, let alone one that isn’t recognized as a great power. I think that this may result in a 1-0 win for Ukraine, meaning Roma goes outdue to the Ukraniaan advancing on away goals. Penalties could be a possibility here (if both leg’s scores mirror eachother), in which case you have to favor the Italians to come through, due to their impressive past in such outings. Overall, I think it will be a very tight tie, possibly going to penalties, but when forced to pick I say Shakhtar goes through. Form is essential in football, and Roma doesn’t have it, struggling to 7th place in the current Italian standings. A win in this tie could turn their season around, but I see Shakhtar’s advantage at home paying off. The first leg of this game will be hosted by Arsenal at Emirates Stadium. The Champions League will always bring a full crowd and Barcelona wont hurt the ticket sales either. Arsenal is tied in first with most goals, scoring 18 goals while Barcelona has scored 14. You can watch for more fouls coming from Arsenal as there midfielder aren't as talented as Barcelona. Arsenal has committed 97 fouls to Barcelona's 56. Barcelona's Player to Watch - Barcelona has so many key players like Messi, Xavi, Iniesta, and Villa. My player to watch is Lionel Messi. I dont have a tough time picking the Ballon d'Or winner as he's been sick with a scorer disorder. He has 21 goals and 14 assists in 18 games. In the tournament Messi has scored 6 goals and 1 assist in 6 games. Arsenal's Player to Watch - The top favorites for this team are Cesc Fabregas, Robin Van Persie and Samir Nasri. The player to watch is the Russian midfielder Andrey Arshavin. He is leading the team with 9 assists and has 5 goals on the season. Arshavin tends to be inconsistent, but in this champions league he has played all games and scored twice while assisting twice as well. I see Arshavin stepping up the spotlight and delivering a well played game. This match should be a walk in the park for Chelsea, but there is an expression that comes to mind for games like these and it’s “That’s why they play the game”. Upsets happen, and while on paper the mighty blues, a perennial Champions League power, should breeze past lowly Copenhagen, but the game isn’t played on paper. Chelsea has been a club of inconsistency this year, breathtaking at the start of the season, and lukewarm since with some great performances in between to keep hope alive. Copenhagen has been the opposite. By far the front runners in the Danish Superligaen, they are undefeated, having won 13 and drew 3 of their 16 games. This must be taken with a grain of salt, because of the lack of competition in comparison to Europe’s other top leagues, but the record is nothing to take ligtly. Strikers Cesar Santin (of Brazil) and Dame N’Doye (of Senegal) need to be the focus of the Chelsea defense in this one, each having scored 13 goals domestically so far this year. This prolific pair, could pose problems for a backline that could have chemistry issues, breaking in new centre back David Luiz, or playing Branislav out of position in the center, where he’s had communication problems with Petr Cech recently. It has to be Fernando Torres. The 50 million pound man is the most expensive player in the history of the premier league, and his purchase was a signal of Chelsea’s intent to win trophies. Roman Abramovich, Chelsea’s Russian owner, has made it clear he wants to win a Champions League title, and he hopes Torres will help get him there. Realistically, I feel Chelsea have 2-3 more years to win a title with this team, and with Torres, one of if not the best striker in the world partnering Didier Drogba (another of the worlds top marksman) up top, they could get the monkey of their back this year. Prediction: I think Chelsea ends this tie early, winning the first leg 2-1 on the road, allowing key players to rest in the second tie, to remain fresh for their Premier League campaign. I also feel we could be in line to see Fernando Torres’s first goal in Blue on their Danish excursion (if he doesn’t net at the weekend). The return at Stamford Bridge will mark the coming together of Chelsea’s defence, and with the chemistry established the Swiss giants will hardly have a chance. 3-0 at home is on the cards here. Overall Chelsea advances 5-1 with 2 massive away goals putting the tie beyond doubt early. A massive tie, pitting the biggest team in France against the biggest team in the world, should be a cagey affair, with both teams wary of their powerful opponents. It’s an interesting one, because the normal viewer would expect Madrid to have no problems dispatching anyone outside the top teams in the world, but historically Lyon have been their kryptonite. Lyon have never lost to the Spanish giants, dumping them out of the Champions League last season. They’ll have a lot of confidence considering their opponent, but it remains to be seen whether or not the powerful French side will be able to handle Mourinho’s Madrid. It’s impossible to pick just one for the French side, with stars all over the field. It starts in goal with Hugo Lloris, a full international and young superstar throughout all of France. In the back, Aly Cissokho is one of the best young left backs in the world, but might not even get a game because of the Brazilian Michel Bastos. Bastos as you may recall from the world cup, has been deployed as a left back, but can play on the wing as well. This is his more comfortable position, and allows him to get forward with less responsibility, resulting in 3 Champions League goals already this year. He is joined by midfield dynamo’s Yoann Gourcruff and Miralem Pjanic, two young superstars in the making with the talent to give any team trouble. Up top its all about Lisandro, the pesky Portuguese goal poacher who has a work rate second to none. He’ll give the Spanish center backs nightmares, as he’ll constantly be popping up putting them under pressure. If I had to pick one, I’d say that Pjanic could be the one to take advantage of the soft spots in front of Madrid’s back line, look to him to pull the strings if Lyon is going to grab a victory. It’s hard to look past superstar Cristiano Ronaldo, and rightfully so. His goalscoring record is truly incredible, scoring 24 goals in just 22 games this season. That doesn’t happen often folks. Imagine averaging 40 points in the NBA, hitting more home runs than games played in baseball, or averaging two touchdowns a game in the NFL, that’s about the equivalent. If you’re a fantasy owner, you’ll appreciate stats like that. No one’s been able to stop him, and Lyon will be hard pressed to break the trend. As a sleeper pick, look to Emmanuel Adebayor, to continue his scoring ways with Madrid. The new signing, on loan til the end of the season, has given the team a new option up top with a long term injury ruling Gonzalo Higuain out. He can be a target player up top, allowing Ronaldo to run deep from midfield, making both more effective. Watch out for these two over the two legs. Prediction: Lyon’s success against Madrid has been eye opening, but I don’t see it continuing here. I feel like Madrid will win the first tie, going home with an advantage because of the away goals in their pocket after a 1-1 draw in France. At the Bernebeu, Madrid will be able to conquer the French side’s fatigue as they chase the game, and Ronaldo will seal the tie early in the 2nd half as the team goes up 1-0 (2-1 on aggregate). Madrid may add insult to injury late, with a 3rd goal in the tie. The Madrid defense is vulnerable, but I think Mourinho will have them ready for his favorite competition. Overall Madrid, 3-1 on aggregate. Manchester United has finally lost their first league game against the bottom of the table Wolverhampton. They are only 4 points ahead of second place team Arsenal. Man U has won the Champions League 3 times. Marseille needs to make sure they score points at home against the English Premier giants. They finished 3 points behind the Group F leader Chelsea in the group stage. Marseille Player to Watch - This individual scored a hat trick against Zilina, which set a Marseille record of 7–0 victory. Andre- Pierre Gignac did not get much playing time early in the tournament but looks like he has proven himself as a starter. The midfield playmaker Mathieu Valbuena should give nice passes to Gignac. Look for him to play 70 minutes and challenge Manchester's defenders like Vidic and if he plays, Rio Ferdinand. Manchester United's Player to Watch - Nani has been playing fantastic this year and deserves to be the "player to watch". In the tournament he has only one goal but this midfielder has great speed and ball control. He uses both of the attributes to make great runs down the side of the field and either cross the ball or make a play to the goal. He has only played two full games but expect him to play full time in both legs. This is arguably the marquee tie in this round of the tournament. People will be on the Arsenal Barcelona bandwagon, because both teams play beautiful football, but you can’t ignore that both of these teams featured in last years final. Since then yes, both have fallen off a bit, with Bayern already conceding defeat to Dortmund in their pursuit of a league title, and Inter falling to third in the Italian league after a difficult run of results under now fired manager Rafael Benitez. Both teams have stars, and distinctive styles, that make this a tough game to call, and it should be an interesting one. Lucio has been the best center back in the world for many years in my opinion. He was great when he played for Bayern, and has only improved for both Brazil and Inter following his move to Italy. Age seems to be catching up to him a bit, but his aggressive nature and great leadership out of the back is something to be impressed by. A great tackler, who never seems to put a foot wrong, can boss the game from the back, something not many people can say. He’s dominant in the air, which could be key on set pieces as well, and likes to make forays forward running at people with flair that shows the Brazilian blood he has. He should be a key to this tie. The other men to watch are Wesley Sneijder and Samuel Eto’o. They’re polar opposites, one is tall fast and black, the other short slow and white, but they complement each other well, just like a ying yang. Sneijder will pull the strings, and hope to use Eto’o’s speed to get behind the slow center backs of Bayern, a weakness they’ve had since Lucio left. With Diego Milito out injured for at least the first tie, the goals will have to come from somewhere, and look to Sneijder and Eto’o to produce. Bayern is stacked as far as attacking talent. Miroslav Klose, Ivica Olic, and Mario Gomez are the strikers at their disposal, with the latter recently finding some great form, that may earn him the nod ahead of the other two. Super Mario, the German citizen of Spanish decent has recently been finding the back of the net, and the big German will be a target in the box for Bayern’s talented wingers to find, hoping to find gaps in Inter’s defense to turn home some goals. The aforementioned wingers might be the best in the world to feature on one team. Frank Ribery and Arjen Robben are scary enough, but when you throw in the up and coming German wonderkid Thomas Muller (fresh off a “rise to fame” world cup) and you have 3 of the top 20 wide players in the world on the same team. I fully expect Robben to make an impact on this tie, as he was the key to the Champions League run this team had last year, and with his recent return from injury, he is in contention to feature. However, because of the aforementioned injuries, and a recent incident with teammate Thomas Muller, he may miss the match if he’s not selected by coach Louis Van Gaal. Bayern’s attacking talent overcomes Inter’s and they get revenge for last year’s final. In possibly my most bold prediction, I am picking the holders to go out early, and feel that the attacking prowess of Ribery, Robben, Muller, Klose, Gomez, and Schweinsteigger pulling the strings, will spur the Bavarian giants onwards. Their pace and trickery will get at an aging Inter defence, and win this game. It’s a banner year for the German league, and it continues when they knock out the Italian giants. Without Milito for the first tie, it throws the balance of the team off, and if he really doesn’t play as reported, I see Bayern winning 1-0 at Inter, with shutting down Sneijder the key. When they return to Munich, despite not having the best home field advantage, they will win again, 2-1. Overall, Bayern goes through 3-1, somewhat comfortable considering the tie is against such a great team.